I love this place because my mum has history here and it ain’t ‘arf posh. The buildings, the built environment are steeped in Victorian social history and all I’ve done since coming in out of the torturous sun is Google about Liverpool Road N7 and N1 and all about the architecture and Eaton Square in SW1. Same same. All my life I knew that “Upstairs, Downstairs” was filmed in Arundel Square. Grr. Not so. 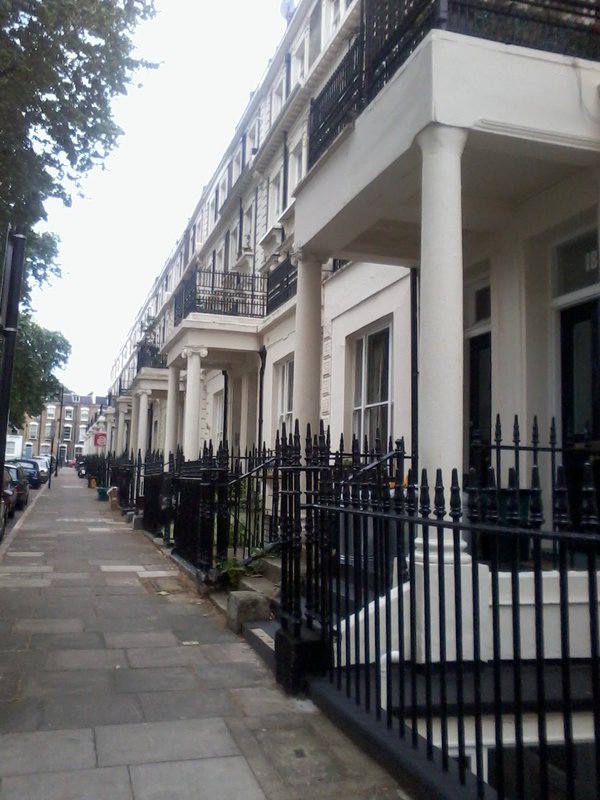 It was Eaton Square in Bloomsbury, London. To the untrained eye, the style of buildings/homes are the same in Arundel and Eaton Squares. A Cubitt as in Cubitt Gallery in Angel Mews, Pentonville Road designed the Eaton lot and had the land in Arundel area where he had a brick-making firm which supplied his Bloomsbury works. Probably all wrong but sounds feasible. Anyway I said “posh” and actually Circle 33 own the above apartments so it’s all social housing; all those basements and lovely steps and railings and balconies and not forgetting the “horns” on the sash windows. With Building Exploratory from Cowcross Street a group of we gorgeous seniors (all in floral summery tops) went walkabout in order to follow through a visit to an architect last April or so when it was teeming down with rain. The architect had built the new houses/flats next to the concrete slab on top of ye olde railway. There was an engineering feat there of mammoth proportions. Concrete? I thought that was a no-no word. 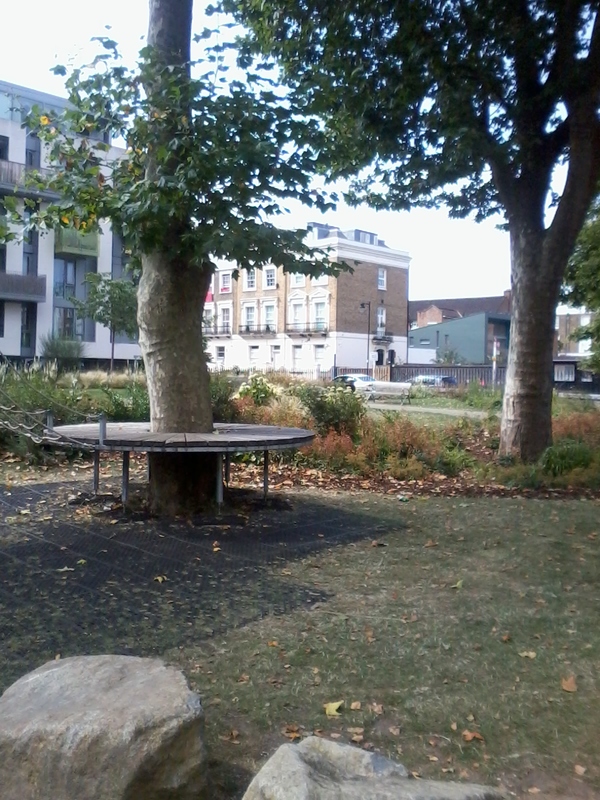 So Arundel Square as in four sides was completed very recently about four years ago. One of our group today actually lives on the square. She is a beautiful calm young woman and emerged from her palace to tell us all about Pocock’s Fields and George Vth and squatters in buses.She’s not a Buildings Exploratory member because she’s too young. One day. What a great time we had. It was baking hot. Gradually the park filled up with mothers in hijabs, kiddies in World Cup tee-shirts, toddlers on scooters and ladies walking pooches. I discovered Liverpool Road’s length all the way to The Angel, familiar territory; popped into crowded McDonalds in Chapel Street Market, then went onto the Claremont Project and signed up for myself and mates to go on art workshops. And why not? Head banging from being out in the heat and failing to drink water. Tut.